This giveaway is now CLOSED. Thanks so much to our wonderful sponsor Energy Muse! We look forward to working with you again! The winner is 'BigHappy'. Remember: There are great giveaways active on the upper right hand side of the page! I have always worn crystal and gemstone jewelry and spent my teen years studying the healing properties of various crystals. The love came down to me from my mom and it became a shared hobby and a life long fascination that we still share. When I turned 14, my mom took me to the International Gem and Jewelry Show. We were like two little kids in a toystore! It was Crystals and Gemstone nirvana for us. I think most vendors took a shine to me because of my natural curiosity about the various properties of the gemstones. I bought a bracelet at that show that I still have to this day and I receive numerous compliments on it every time I wear it! I actually wore it to an event not long ago and everyone seemed to notice it. I wouldn't even begin to know where they could find it today! I have also learned to combine gemstone jewelry with my meditations and my meditation space. While the properties of various gemstones are too vast to list (I actually bought a great book at the tradeshow listing the various properties), for those who don't know much about crystals except that they are pretty or that they have a few gemstones on some of their jewelry, what I tell people is that they are a tool to help you enhance what is already within. Those that are more skilled can begin to use them in diferent ways including bringing about healing. What I learned early on, is that you will somehow find yourself 'drawn' to a particular piece. Your spirit will tell you which one you need. Have you seen those bins of mixed assorted gemstones, that are sold to be added to a bag that you carry with you? I had a vendor once tell me to put my palms over the bin not touching any particular stone, preferably with my eyes closed. Then after a minute to go into the bin eyes still closed, and pick a stone. I'd say at that time I would reach for the same two stones either Rose Quartz or Tiger's Eye. Years later when conducting this experiment again it became agate, usually blue, after that amethyst. I still enjoy this experiment to this day. and I still carry my stones with me daily. I believe we manifest things in life when we are truly vibrationally aligned to our intentions. Is there a magic crystal that can cure all that ails you and magically make your life better? NO, there is NOT. But they do help you to enhance and tap into deeper parts of yourself and help you clear those roadblocks, not just the external ones, but the ones you place upon yourself. I feel what Crystals and Gemstones do for your spirit is something like what yoga can do for your body. With both, you must be truly consistent to benefit from their affects! Our mission is to educate and reconnect the world to the ancient wisdom and healing properties of crystals. Energy Muse is a conscious lifestyle brand providing tools of empowerment, inspiration and hope. Each piece combines energy and intention which create a desired outcome. We believe that every one of us is a healer, teacher and messenger. Every one of us has our unique story. Energy Muse jewelry serves as a tool to help you tap into your inner power and manifest your desires. The time to change the world is now. It is up to every one of us. We are the people we’ve been waiting for. I am very happy to have connected with a brand whose mission is very much similar to my own. Ascending Butterfly was founded as community of inspiration seekers. My mission is to share with you the best sources of inspiration I can find, body, mind and soul (and yes, my love of butterflies too, the symbol of transformation!). Don't you just love that intention room? I can't wait to visit them in person! The name RUNE means mystery, secret talk, something that is hidden. The earliest runic stone inscriptions date back to the late 3rd century AD, although some believe that these ancient alphabets had been used centuries before. Each rune has a meaning. Early runes were used as magical signs that were used for charms and guidance. These runes are all in an upright position, and represent a path that you want to move towards. Our future is not fixed; it is created with the choices that we make. Today runes have been rediscovered as a symbolic system. They share stories of the wise ancient people who created them in a time when people were deeply connected to nature, cycles of the solar system and spirit. Wear your rune charm, and infuse its energy with your own. A powerful symbol for a powerful you, these ancient charms will share a story. Listen to their wisdom. ﻿Malachite was the favored stone of the Egyptians. The ancient Pharaohs lined their headdresses with malachite to raise their vibration and to protect themselves from the “evil eye”. Believed to draw in success, this stone assists in breaking patterns of self sabotage and limiting beliefs. It releases negative energy and protects from ill fortune. Ruby renews a passion for life and reminds you to follow your dreams. It improves motivation, enthusiasm and personal will. Rubies are considered royal stones that bestow many blessings. Citrine is known as the stone of abundance, it attracts wealth, success and opportunity. Citrine carries the energy of the sun so it is filled with light. Citrine does not hold negative energy; it emits positive energy and teaches how to manifest dreams into reality. The wealth rune attracts riches, success and financial freedom. Years ago I stumbled on a website that offered 'rune-scopes' and I thought it was the most fun site ever. It seemed like the universe worked it's magic in bringing me and energy muse together, particularly for this piece. I love gemstone and crystal jewelry and I have been fascinated with Runes for years. (I've always wanted a Rune deck!). This necklace comes boxed in a signature box with a card that contains not only information about your necklace, but also on how to activate and use it! It gives you a list of affirmations to say for 21 days. Research shows that it takes 21 days to formulate a new belief! This Rune will help you to focus on believing in Riches and Wealth. The repetition of the affirmations changes your mindset and opens you up to the bounty of life! I have been wearing this Rune daily as recommended and I have been saying the affirmations that come with it, and I can say I have had some amazing doors open to me that felt like they had been closed for so long! I do realize that the affirmations caused a change in thinking, and that shift of consciousness allowed me to make necessary changes in habits, that I coupled with a lot of hard work, this necklace served as a beatiful reminder that the path of riches, wealth and success is one we can all walk down if we CHOOSE to. There have been tangible rewards and wonderful gifts that have come my way very much in conjunction with when I began to review this necklace! Coincidence? Win it for yourself. If you can't wait to win it, buy it for yourself and then YOU decide! Definitely an amazing holiday gift choice for the yoga lover in your life, and for any woman or man who wants to manifest something wonderful in their lives, be it health, love or wealth! Ƹ̵̡Ӝ̵̨̄Ʒ - WIN IT! - Ascending Butterfly and our friends at Energy Muse, want you to experience the Rune of Riches Necklace too! One winner will receive the Rune of "Riches" Necklace, ARV $184.99! ﻿﻿Don't you just ♥ Energy Muse? I know I do! Ƹ̵̡Ӝ̵̨̄Ʒ - How to Win: (1) You must be a PUBLIC follower of Ascending Butterfly to be eligible for this and all giveaways. Indicate in your entry that you follow (if your 'comment name/user id' differs from your profile id, please let me know what name you follow under) and (2)MANDATORY entry- Visit Energy Muse and Link us to another beautiful item you would get other than the rune of riches necklace! (3) You must also leave your email address somewhere in your comment. (You can format it this way for security, example: ascendingbutterfly AT mail host DOT com). (If your email is clearly visible in your profile, you can just say so, that's OK!) Please follow the easy 1, 2, 3 steps to winning (or in this case, the A,B,C’s of winning!) This giveaway is open to USA residents who are 18 years of age or older. No PO Boxes. FTC Disclosure Info for this Giveaway: This is not a paid insertion. This is a non-compensated post and all opinions regarding the product and the sponsor are my own experiences. I was provided product to facilitate the review and giveaway. The sponsor is fulfilling directly to prize winner(s), this in no way influenced my opinion of the product. Once a winner is selected and their information has been forwarded to the sponsor, the responsibility of prize fulfillment rests with the sponsor. The whole family gets together for dinner and to exchange gifts on Christmas Eve. I am following energymuse on twitter. I entered your Layla Grace giveaway. Entered the Layla Grace giveaway. I would love to get the Dream Necklace. My night before christmas ritual is to bake cookies for santa and then eat them as I fill the kids' stockings! Wow these are amazing necklaces and other jewelry! 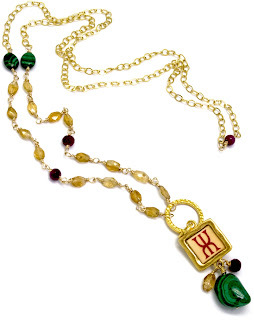 I love the Brow Chakra for starters: http://www.energymuse.com/store/index.php/women-s-jewelry-1/chakra-6-neck. favorite Christmas tradition is taking the kids out to see the Christmas decorations and displays around the city! These earrings are to die for! I voted for you on "it's thoughtful". Our favorite pre-Christmas ritual is to decorate the Christmas tree with sweet clementines and chocolates wrapped in colorful aluminum foil. I follow @energymuse on Twitter (@CKhalaj). I follow you on Facebook (catalina khalaj). I've become a fan of Energy Muse Jewelry on Facebook (catalina khalaj) and left the indicated comment on their wall. I follow Ascending Butterfly via Networked Blogs (catalina khalaj). I have joined Ascending Butterfly's New Community Group. 12/11: Voted for you on Fuel My Blog (as Callina). I entered your Dream Tisha giveaway. I entered your Valentino Sheet Set giveaway. I entered your Layla Grayce giveaway. On Christmas Eve, we go to a children's mass, come home and drink hot toddies, and open one gift! Night before Christmas ritual: Eat something wonderfully delicious & everyone gets to open just one gift. I follow Energy Muse on FB and Twitter. I've become a fan of Energy Muse Jewelry on Facebook Cynthia Sexton and left the indicated comment on their wall. I love the 6th Chakra Necklace "Brow Chakra" because of the blues and purples in the piece. I'm a public follower (won). The night before Christmas my family goes to a friend's house to eat and share stories. She has around 20 people there and we all catch up on the year's happenings within each family. It's a wonderful family time. I Like Energy Muse on Facebook and left them a message. On Christmas Eve, we all have an Italian dinner of pasta & fish and then attend Midnight Service at our church. GFC follower & I like http://www.energymuse.com/store/index.php/women-s-jewelry-1/chakra-7-brac.html & email available on blogger profile. On New Year Eve, we all go to our church which hold family style games and sing alongs. I would love to get my husband the Men's Health Necklace: http://www.energymuse.com/store/index.php/men-s-jewelry/health-neck.html. The trick would be getting him to wear it and say the affirmation, but at least I could try. Our Christmas Eve Ritual: My husband's family never had stockings, and mine always did. He's also impatient for presents. So, we open our stockings to each other on Christmas Eve, and the rest of the gifts on Christmas morning. Their jewelry is amazing. Thanks for the chance. I am a public follower under 'winemonster'. I would love the Earth Necklace for my wife. You can see it at http://www.energymuse.com/store/index.php/shop-by-intention/wealth-success/earth-c-neck.html. You can reach me at winemonster AT gmail DOT com. This is the perfect piece for me. Separated after 24 years last New Years' Day. Dedicated to my spiritual growth for the past year and half - coincidence? - their are NO coincidences - LOL. Excited about what life and spirit teaches me everyday! ennett UNDERSCORE j AT bellsouth DOT net. On Christmas Eve my entire extended family gathers for lots of food and laughter. Stories of when we were younger and memories of those who are no longer with us in body. We open gifts and divide up allll the leftovers with great love and laughter. My husband and I separated this year after 24 years so I get to make up my own rituals for what happens when I return to my own home! I follow Ascending Butterfly on fb. I follow Energy Muse on fb. Hi - I joined the new Community/Real Time Chat group. Can't wait to learn more. I love to get the Dream Necklace. I LIKE THE WISH NECKLACE! I am a public follower on GFC. my night before christmas ritual is spending a Christmas eve dinner with my Mexican family friends that does not start until 1AM, little kids and all lol. I love the Sacred Stones Bracelet. The colors are beautiful and the message is powerful. Christmas this year, we will watch 8 DVDs of classic Christmas movies and animated shows. I will bake Gingerbread Men, Sugar cookie cut outs and Petit Fours. We ordered a bunch of Yummy things from Swiss Colony so we will be eating those. For dinner we will have a roasted brisket, Broccoli Cheese Casserole topped with Bread Crumbs, Potatoes & carrots cooked with the Brisket. For New years we will eat black eye peas for good luck and 12 grapes at midnight to make 12 wishes for 2011 and a toast with sparkling grape juice and watch the ball drop online at Times Square. And my husband and I will share our holidays with our 20 babies (Cats) and drink hot Cocoa with French Vanilla Marshmallow Snowmen. Good Fortune Necklace is beautiful! I love a necklace from the 'balance and focus' line called 'Energy Necklace' It helps to enhance Movement, Flexibility and Fluidity and I could use more focus in these areas, I tried Yoga recently for the first time ever, and I really think this will enhance my sessions! The affirmation is awesome too! 'Affirmation: I am alive and feel energized and empowered.' I agree where it reads ' Tapping into our personal energy source is one of the biggest gifts we can give ourselves. Allowing the time and space to give ourselves the gift of energy is vital.' That is why I am a big lover of meditation! I voted on Fuel My Blog! I am a member of the real time chat community group! I comment on quite a few non giveaway entries, especially on several winner's announcements! I joined EZ Win Game!